It may be hard work, but I get an endless amount of satisfaction from working in, and seeing the results of our labour in the backyard. At ¾ of an acre, it's a rather large garden, actually appearing to be larger than it is in reality, due to the borrowed scenes of the farmland back and front. I've forgotten the name of the plant in the basket - easy to propagate & only flowers for a very short time. It's no secret that I do like to repurpose items when I can, both refashioning with sewing, and finding alternate uses in the garden for old items. The baskets, above and below, are sitting on old kitchen stools. Made from heavy metal, with wooden seats, I couldn't see anyone wanting them, so didn't bother taking them to an Op Shop (Thrift Store). They're at least sixty years old, but with a new coat of outdoor paint, they now have a new lease of life. 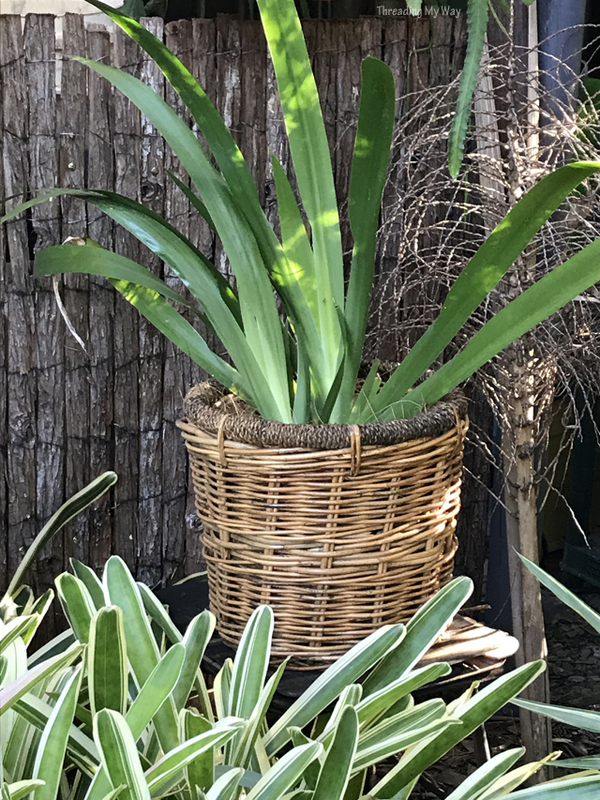 Indoor baskets have become outdoor containers. 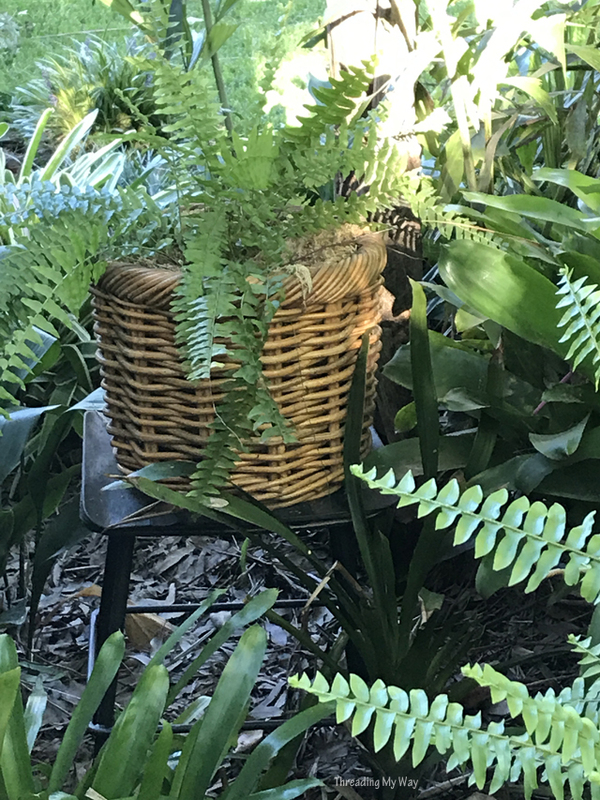 The plants are in plastic pots inside the cane baskets. I'm sure they'll eventually rust, but I figure this is better than going to landfill. Common fish bone fern in a plastic pot inside an old liquor bag. 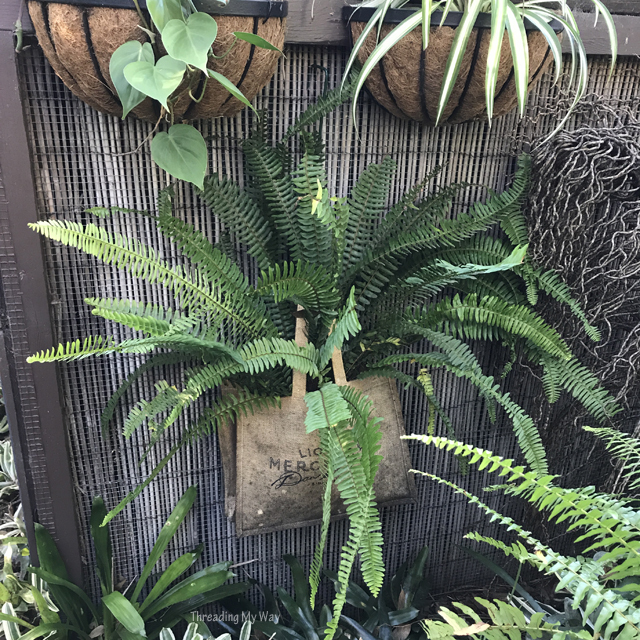 Another repurposed item is the liquor bag, made from plastic coated hessian (burlap) - makes the common fish bone fern quite showy. To the right of the fern is the left overs of a bunch of seeds from a cocos palm - also in the photo two above. They make me think of what brooms perhaps looked like when people had to make their own. I rather like their structure, so have started to dot them around the place. 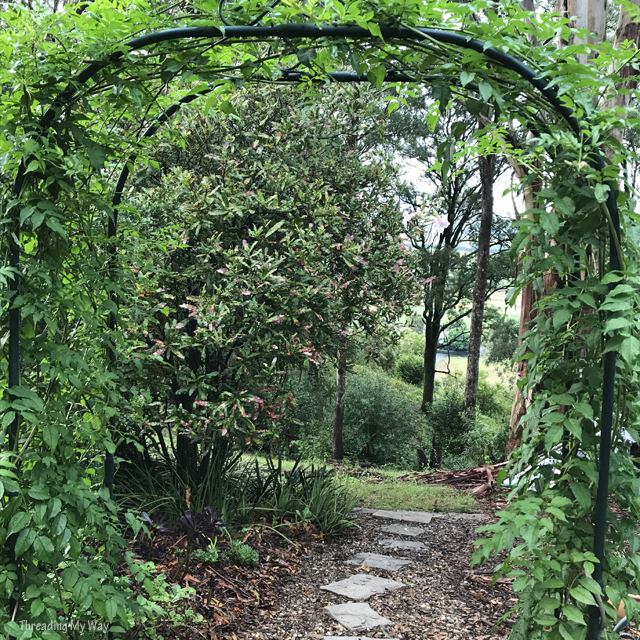 What is it about an archway? Always makes you want to see what's on the other side. Stunning red flowers on the bromeliad, with dietes in the background and chrysanthemums in the foreground. Our garden is rather eclectic - no one style - whatever we like that works. Perhaps we should be I, even though it is our garden. The reality, however, is that it's me that will happily get lost in the garden for hours, whereas Mr TMW doesn't have quite the same passion. He'd prefer to look at the results, rather than do the hard yards. 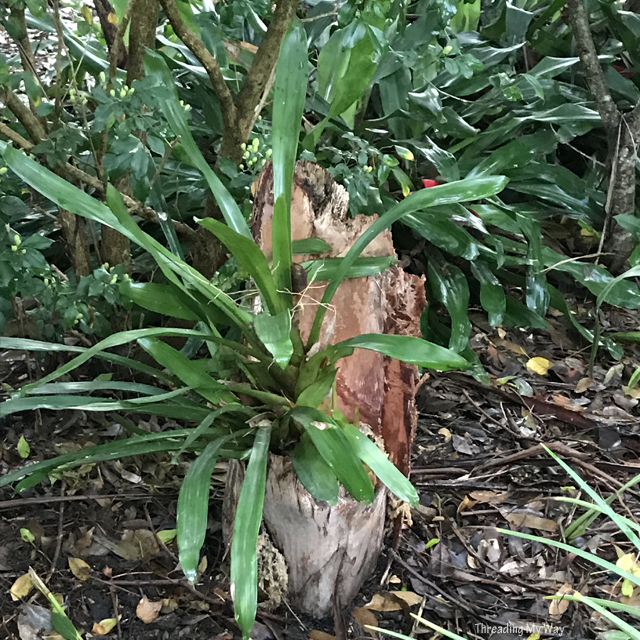 Suits me fine, as that means I get to make more of the decisions about what goes where, and that allows me to be more creative - case in point, the bromeliad above. It's planted between two cut off cocos palms, which are wedged into the ground. 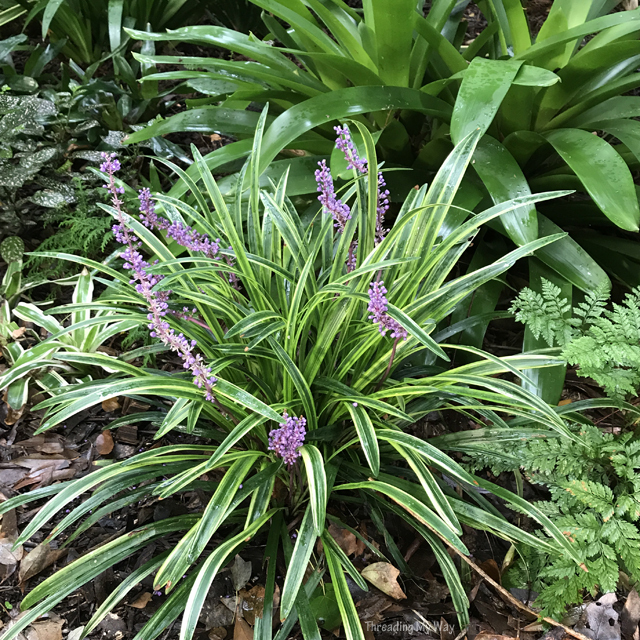 It's only newly planted, but I think it'll work rather well as it grows. Mr TMW is happy to cut the palms to the sizes I require. Glimpses of the view, rather than seeing it all in one go. Some people wonder why we've grown bushes which obscure some of our glorious view. 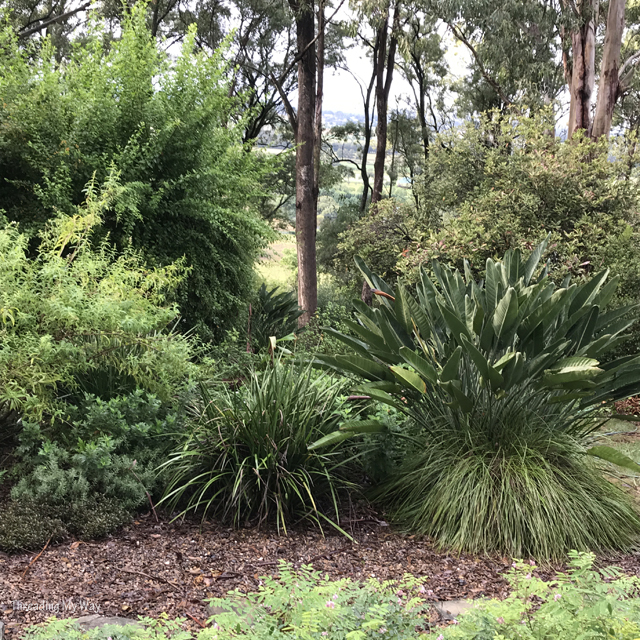 Yes, if we cut down, or pulled out some of the vegetation, we'd have a much broader view - you could take it all in, in one go. There's a lot to be said for that, but we've decided we'd rather have glimpses of the view through the garden. It kind of invites visitors, and us, to explore further, rather than viewing it all from the back door. If you're reading this from the Northern Hemisphere, you may think I've mislead you with the title of today's post. It most probably doesn't look at all like Autumn (Fall). Although there are no photos of deciduous trees, we do have some, but they are only just beginning to lose their leaves. And, because the weather isn't overly cool, the leaves don't change to the beautiful colours that are seen elsewhere in the world, or colder parts of Australia. In many parts of our garden, I could take a photo of the same place in each of the four seasons, and you wouldn't be able to tell what time of the year it was taken. And this means, I can garden throughout the year. For some of you, that would be heaven, whilst for others - a nightmare. Tell me, what's happening in your corner of the world at the moment? If you think you've seen some of these photos before, you must be following along on Instagram - that's where I show lots of photos of the garden, along with places we visit and the odd sewing photo. Temperatures are above normal. We are getting spring rains today and they are sorely needed to keep down the dust. Street cleaners haven't been out yet to clear off sand and gravel that is spread down during the winter to provide traction. Two days ago, our entire back yard finally made an appearance sans snow. 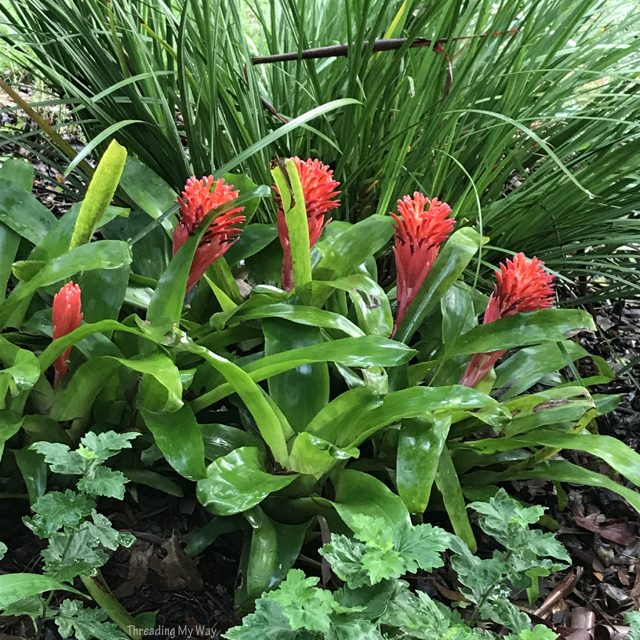 Love your bromeliads. We can grow them here as houseplants of course, but rarely get the chance to see several in one place. I have loved strolling through your beautiful garden this morning, Pam. How lovely and verdant it all is. The archway tempting one to walk through and discover what is on the other side is gorgeous. I too love the thought of tempting the visitor to explore what is around the bend in a garden. I must say you have gorgeous views of farmland. Isn't it wonderful to be smack in the middle of farmland. 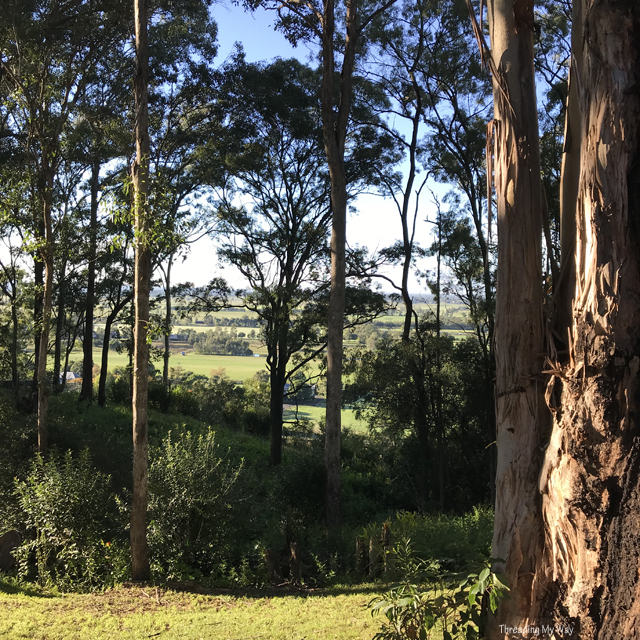 We too have a garden which happily nestles in green as green paddocks with a distant view of forests and mountains. It's getting a wee bit chilly down here and the trees here are beginning to dress in glorious hues. Jack Frost has visited too. Wish oh wish he would stay away. Thank you for this lovely post, it has put a smile in my morning. Bonjour, Votre jardin est magnifique et cela doit être un plaisir de s'y promener pour profiter de son calme. J'habite à 200m d'une autoroute et ce n'est pas la joie. Merci, Dany. J'ai beaucoup de chance d'avoir un si grand jardin. Cela me donne vraiment beaucoup de plaisir. Merci d'être passé. J'espère que Google Translate a bien traduit mon anglais. Cela fait de nombreuses années que j'ai appris un peu de français à l'école. You have a lovely garden Pam! I would love to wake up in the morning, sit with my coffee and stare at this breathtaking view. You definitely have a green thumb! Thanks, Diana. It's lovely to sit out in the garden for breakfast.